We offer Designer Cotton Tunics in various kind of beadwork, embroidered work etc., that makes our collection popular amongst people across the globe. These Tunics are unique in look. 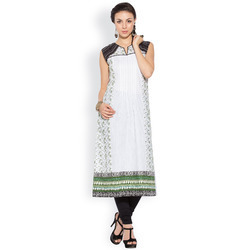 These are fabricated using optimum quality material and latest techniques as per the set industry norms and procured from reliable traders.Designed as per the latest trends, our kurtis have good finish. Ladies Indo Western Top Kurti. Our team of expert designers have manufactured these designer tunic using best quality fabrics, threads and allied material. Due to their latest designs, attractive patterns and beautiful colors, these tunics can be worn at both casual and party occasions. Our quality team has been dedicated to the aesthetic and high grade stitching of the product. 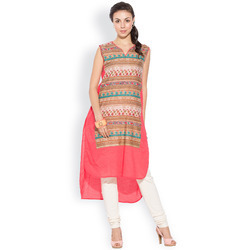 This kurti can be paired with salwars, and churidars as per the occasions. Beautiful Party Wear Designer Long Kurta We are offering Designer Kurtis Tunic which are fabricated using pure cotton fabric and can be embellished, designed and styled as per the different requirements of the customers. Leveraging on our years of experience and in-depth knowledge of this domain, we are offering an alluring range of quality-assured Traditional Casual Kurti to prestigious clients. 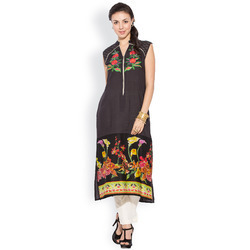 Our expert professionals design & develop these kurtis as per the latest fashion trends. Blue Georgette Kalidar Kurta With Resham Mirror Embroidery On Neckline And Sequence And Sating Detailing In Hemline.